Hey everyone it’s been a little while and I know you’re all just as excited as we are about the next episode of Wood Talk Online!! Don’t miss the chance to check it out before it’s posted and participate in the live recording of the next show. 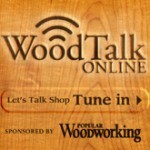 We’ll be discussing all kinds of stuff including the Woodworking in America Conference, a new tool from Lee Valley, the woes of building a new shop, plus your voicemails and emails! All you need to do is visit the Live Page at 8pm Eastern on Thursday. So for good conversation with fellow woodworkers in the chat room and maybe even a chance to hear one or both of us mess up and have to start all over again, be there, this Thursday May 21, 2009 at 8:00PM E.S.T.